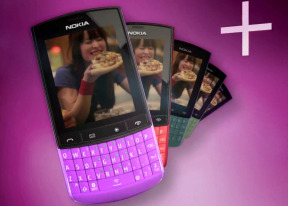 The Nokia Asha 303 has a 3MP fixed-focus snapper that produces photos with maximum resolution of 2048 x 1536. The camera interface has been updated so it's a lot more like Symbian. On the screen you get a column on the bottom with the virtual shutter key in the center and the back and options keys besides it. You can use the camera in portrait mode only, there is no option for landscape orientation. A tap on the screen reveals more controls - indicators (photos remaining, resolution and white balance), digital zoom controls, and three shortcuts for video camera mode, gallery and self-timer. All these auto-hide so they don't take up space on the screen. Going into the Options menu, you get a popup that looks like the one on Symbian. There are controls here for effects (greyscale, sepia, negative), white balance, a viewfinder grid and extended settings. The shortcuts in this popup can be re-arranged but you can't pull any of them out onto the viewfinder. This popup also features animations, but they are rather slow. The image quality is good for a fixed-focus 3MP unit. Photos are quite noisy but the post processing manages to mask a lot of it, at least in bright areas. Shadows however have tons of noise. Contrast and color rendering are good and the amount of captured detail is as much as you would expect from such a camera. Here are the samples the Asha 303 produced. We’ve also added the Nokia Asha 303 to the database of our Photo Compare Tool. Here you can see the Asha 303 is a decent performer in the 3MP league, but you can still notice the high noise levels. Video recording isn't something the Asha 303 is good at. It does VGA at 15 fps, quite basic for a 1GHz phone. The video quality is decent, with good colors and enough amount of detail. The videos will do for MMS, but that's all. The Nokia Asha 303 offers quad-band GSM and UMTS support. There is also HSPA support, download speed potentially reaching 10.2 Mbps, and up speed as good as 2 Mbps. Bluetooth is version 2.1 and A2DP is, of course, enabled. The Nokia Asha 303 uses a microUSB port for both data connections and charging. The bigger treat though is USB On-the-go. The Nokia Asha 303 can access USB flash drives and even other phones (card readers don’t work). Non-Nokia-made handsets generally refused to share their memory. If you happen to connect two USB on-the-go devices – the master and slave in this connection is determined by the end each of the devioces is connected to. By the way, a special USB-OTG-enabled cable like the one that came with the Nokia N8, is not included in the Asha 303 box. You’ll have to buy one separately. Wi-Fi connectivity is also at hand. In fact, the Wi-Fi is one of the key features of the Nokia Asha 303 – it is one of the cheaper Wi-Fi enabled phones on the market. The Nokia Asha 303 also comes complete with a memory card slot. Coupled with a card reader it can usually give you the fastest data transfer rates.